The tough blond boxing champion, Becca, is confronted by a cocky Sinn Sage while she’s shadow boxing. Sinn makes fun of her belt, calling it fake, then challenges her to a match. Becca, a serious fighter who recently destroyed Kristie Etzold (see "Jab Fest: Becca's Revenge"), remains silent but the look in her eyes shows that she’s not impressed by Sinn. The match begins and Sinn quickly realizes that she bit off more than she can chew! Becca tears her apart with mostly jabs, causing Sinn’s head to snap back from punch after punch. The visiting boxer manages to get some punches in but she soon realizes that she’s not hurting Becca. Sinn’s eyes go wide with surprise as she realizes that she’s going to be destroyed by our pretty blond boxer! 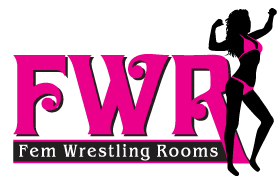 We think you’ll LOVE seeing Becca destroy Sinn Sage in the FWR boxing ring! Get this 13 minute, 399MB video for only $12.95!